where Sn consists of the first n elements in the sequence. Is it possible for D(n) to stay in O(1)? Many years later, Schmidt proved that D(n) can never be in o(log n). In other words, there are limitations on how well the discrete distribution, x → ∣S n ∩ [0, x] |, can simulate the continuous one, x → nx. The study of this intriguing phenomenon and its numerous variants related to the irregularities of distributions has given rise to discrepancy theory. The relevance of the subject to complexity theory is most evident in the study of probabilistic algorithms. Suppose that we feed a probabilistic algorithm not with a perfectly random sequence of bits (as is usually required) but one that is only pseudorandom or even deterministic. Should performance necessarily suffer? In particular, suppose that one could trade an exponential-size probability space for one of polynomial size without letting the algorithm realize the change. This form of derandomization can be expressed by saying that a very large distribution can be simulated by a small one for the purpose of the algorithm. Put differently, there exists a measure with respect to which the two distributions have low discrepancy. The study of discrepancy theory predates complexity theory and a wealth of mathematical techniques can be brought to bear to prove nontrivial derandomization results. The pipeline of ideas that flows from discrepancy theory to complexity theory constitutes the discrepancy method. We give a few examples in this survey. A more thorough treatment is given in our book . We also briefly discuss the relevance of the discrepancy method to complexity lower bounds. 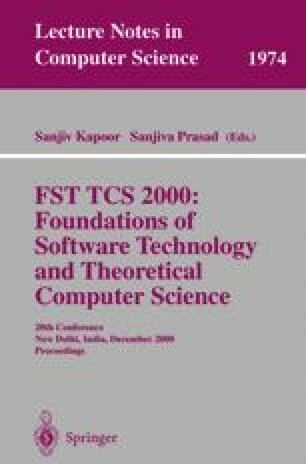 Proceedings of FSTTCS-2000. This workw as supported in part by NSF Grant CCR- 96-23768, ARO Grant DAAH04-96-1-0181, and NEC Research Institute.